A drive to nearby Lamin Lodge, a wooden structure on a river bank and within a mangrove swamp, was followed by lunch whilst overlooking the mangroves. The mangroves held quite a few bird species, unfortunately most were too far away to be seen well or, in some cases, identified. However, the Grey-headed Sparrows nesting in rafters of the lodge were very accommodating! So, what did the mangroves hold? Some, at least to me, surprising species: Red-billed Firefinch, Yellow-crowned Gonolek, Common Wattle-eye and Little Bee-eaters, plus some distant sunbirds. More expected were Great Egret and Western Reef-egret, Pink-backed Pelicans, Whimbrel and Common Redshank and Sandwich Tern. New for the trip were three Subalpine Warblers and a Broad-billed Roller, plus a few Blue-cheeked Bee-eaters feeding from perches and flying past. After lunch we drove to a nearby village, although I have no idea where it was, and set up 'scopes to, apparently, stare at the branches of trees. Hidden in the depths of this grove was a single White-faced Scops-owl and, with a few contortions, we managed to see it well. 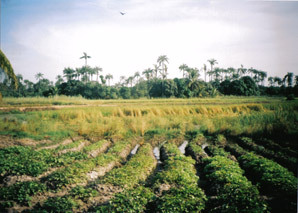 On another day we left Abuko and headed for Lamin Ricefields, near where Solomon was brought up and lives. Ricefields was a true enough description but not a complete one. The area included what looked like a graveyard for old cars and a ready supply of sewage! The sewage outlet certainly attracted the Hooded Vultures! There were at least 50 here, mostly in trees and on the ground. A muddy area held three Wood Sandpipers, two Western Reef-egrets, Great, Little and Cattle Egrets, Squacco Heron plus four African Jacanas, a Shikra in a tree, four Spur-winged Lapwings, three Common Greenshanks and four Common Redshanks. African Mourning Doves were heard and seen closely. As ever we had a target species to get. In previous paragraphs I have raved about Solomon's bird-finding ability. This one must be ranked amongst the best. He looked at the reed-fringed edge of the muddy area, borrowed my 'scope and announced he had found a male Greater Painted Snipe! The true worth of this can be seen when I explain that naked eye this bird was invisible. Through binoculars this bird was invisible. Through a 'scope it was invisible until one's eye suddenly realised there was actually a bird in the field of view. Each time I looked again through the 'scope I had to put in effort to find the bird again even though it hadn't moved. We were truly impressed. To further entertain us Al stood in a shallow puddle which turned out to be a four foot deep pool of what might kindly be described as water – well, it had water in it!